No pithy message. Just want you to save the pic to your hard drive, and look at it every time the girly narcissist on the right side compares himself to the real man on the other. Seriously, who the hell does he think he’s kidding? Next Post The Big Issue of 2012 is Women’s Rights? We can probably swing the aviation security slot, but if you issue firearms to liberals I’m not getting on a plane. Remember the photo of Al Gore slinging a rifle… With the barrel pointing at his own head? Am I the only one that’s unsure whether that’s a girl’s bike? 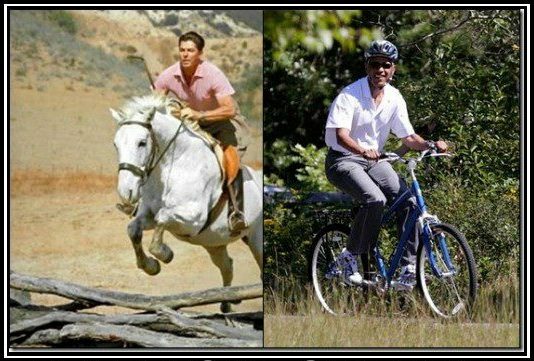 At least Ronny ain’t ridin’ sidesaddle! Cant tell Doc. Looks like it. Is that a little ringer thing on the left handlebar? Hell, I’m almost shocked not to see little plastic streamers coming outta the ends of the handlebars. To be fair I’m glad to see the helmet. We wouldn’t want him to risk a fall from that height at the impressive speeds he appears to be traveling. BTW, Rob…. you didn’t by any chance Photoshop a Hello-Kitty bicycle basket out of that shot, did ya? Naah… he probably took that off to lighten the load. He’s clearly built for speed. What a wild man.